©1983 SYDA Foundation. All rights reserved. Recently while I was swimming, I saw a stone shaped in the form of Lord Ganesh. I offered pranam to Lord Ganesh in this form and chanted the mantra to honor him. As soon as I finished chanting, a wonderful group of little blue fish passed by. I had never seen fish like this there before; I felt they carried the blessings of Lord Ganesh. This experience was so sweet and amazing! 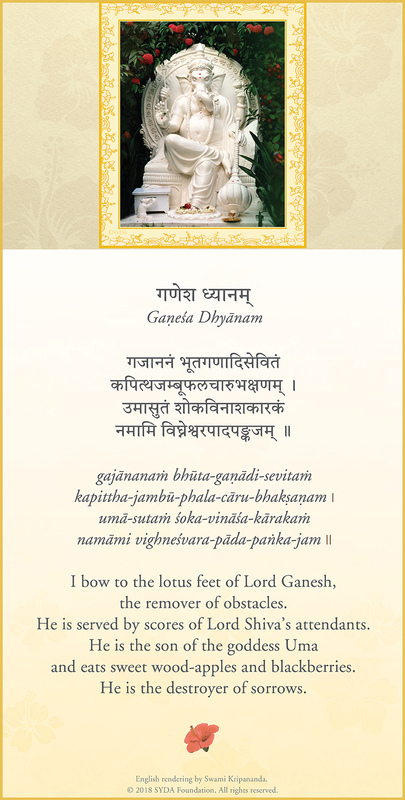 I do love this verse dedicated to Lord Ganesh. I have often recited it before the Shiva Mahimnah Stotram. Its melody opens my heart and fills me with devotion. Since the verse has been posted, I have been reciting it three times before dinner, along with the reading of a quotation from the Gurus and the chanting of Om Namah Shivaya. The silence that follows this recitation is vibrant with love and longing. To be able to invoke Ganesh is very precious. This verse brings the sacred atmosphere of the Ashram exactly to where I live—in the present moment. Merci infiniment for reminding me of this verse. Before meeting the Guru, I felt a separation from others. Seeing this beloved statue of Ganesh, I remembered an experience I had immediately following a Shaktipat Intensive I took many years ago at Shree Muktananda Ashram. As I sat in the bus at the entrance to the Ashram waiting to go back to Manhattan, I relished the powerful and sweet bond of love with God that permeated my being. As I gazed at the statue of Ganesh, which I could see from the bus window, it came alive with scintillating conscious energy; the trees, flowers, buildings, and the people on the bus, all were animated with this conscious energy. I was filled with a gentle ecstasy, as I experienced the unity of all things. This feeling continued as we drove through Manhattan. The city, which previously had sometimes seemed chaotic, looked to me like a sweet paradise. I recognized that everyone and everything shared the same beautiful essence. Since this experience, I have felt a tenderness for Lord Ganesh and heartfelt gratitude for the grace of the Guru in lifting the veil of separation and showing me the unity of all things.